Have you ever caught yourself saying, “I'm too young, too old, too new, or too whatever to do the thing you want to do? Because if you have (like most of us have), then you're going to love this episode! I am excited to introduce you to my friend, Hope Taylor because she started her business when she was 16 years old. So, let’s just say that she has faced adversity, criticism, and those voices in her head telling her she’s too young, too new, too whatever. But she is pulling back the curtain, sharing it all with us and sharing with us the journey of building a successful business! She is a photographer and educator in the creative industry, she speaks at events and major conferences, but more importantly, she hosts her own workshops as a big part of her business. 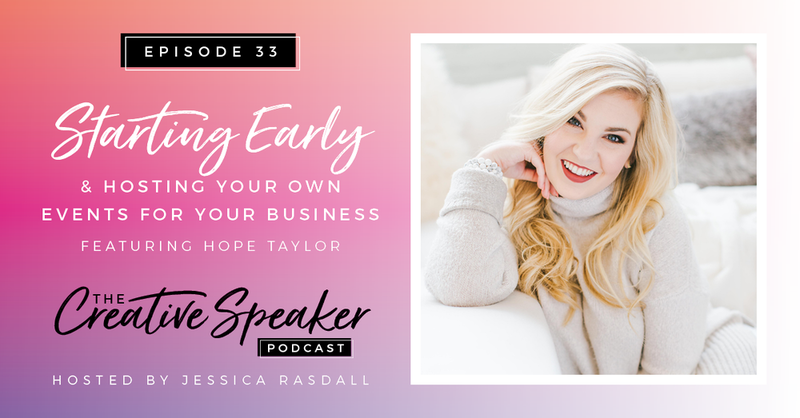 She has a lot to share with us about how to actually add education to our business in a way that is seamless, that doesn't confuse our audience, that really just helps build up our credibility, and makes us known as that “go to person” in our industry. So if you're looking to start taking those leaps as an educator or you're wanting to host your own events and add this new area to your business, grab a pen because this episode is for you. Your life is your own. Take the reins and just run with your creativity and business! You don’t want to look back wishing you had done it sooner. Just go for it now! Whatever the thing is you want to do, know that you don’t have to fit into the box that everyone else is in. Take the time to figure out what your thing is and how it will work for you, not everyone else! Personal marketing will help keep your audience engaged in everything you do as you start adding in different events or education tools to your business. Keep them involved in the process! Narrow down the areas of professionalism you want to be known for (and are really good at!) then start teaching on that and hosting events around that education. Use the code CREATIVESPEAKER for 10% off the courses listed above. If you loved this episode and it motivated you to add speaking to your business, please take the time to leave me some positive feedback on iTunes. I’d also love to hear about your biggest takeaway. Take a screenshot of you listening on your device, post it to your Instagram Stories and tag us @thecreativespeakerpodcast. *Affiliate links may be included above. However, we only share resources with you that we personally use and love!